When it comes to keyword research, it’s easy to fall into the trap of thinking that tools will do the job of brains. Let’s clear that out from the outset: they won’t. Tools are only as good as their handlers. 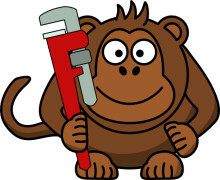 Give a spanner to a monkey, it’ll find ingenious ways to use it. Give the same spanner to a dog and it goes from tool to toy. Use tools wisely.